There’s still time to enjoy Labor Day Specials on our Sunset Beach vacation houses if you’re planning a last minute trip to the area. There’s a lot to do over this long weekend as we move slowly towards the off-season in our coastal paradise. Whether you’re into beach music, sandcastle contests, or all-you-can-eat barbecue, you’ll find it in the surrounding area this holiday weekend. Our Sunset Beach vacation houses will provide for all of your needs. They come fully furnished with beach décor and have well equipped kitchens and spacious living areas. You could stay put in rental and still have a glorious vacation — they’re just that good! If you act fast you can get in on this last minute Labor Day Special on an oceanfront house. 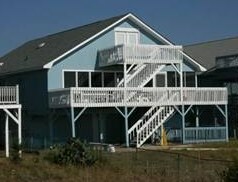 Save $400 when you rent Egrets Roost the week of Sept. 1-8, 2012. This home sleeps 14 people in its 5 bedrooms with 3 bathrooms. It’s a spacious oceanfront home located on the east end of Sunset Beach. Wonderful amenities include central heat and a/c, 2 CCTVs, DVD, stereo, dishwasher, outdoor shower, and washer/dryer. Decks with incredible views and a screened porch are a great place to begin your day with breakfast. High speed internet access keeps you in touch with friends. This home was recently renovated and has a lovely interior with all of the upgrades you would expect.